Wanted to send a short note to get you up-to-date on Bodacious Dream and the upcoming World Championship Regatta. I’ve been finishing up preparations of the boat for competing in the race that begins here in La Rochelle next Wednesday, October 3rd. Last week, we hauled Bodacious Dream out of the water at the local yard to do a complete check and a wet-sanding of the bottom prior to the racing. This to make sure that the underbody is super smooth, reducing any drag and making us as quick through the water as possible. This week has been spent tacking new battens and sails that we first had to get through customs and into our hands. With the help of Adam from Peters and May shipping, it was far easier than the frantic time we had trying to get our spinnaker prior to the Normandy Channel Race. My crew of 5 begins to gather this weekend, and we’ll get in some practice time on Sunday and Monday. Some of these guys were involved in the launching and testing of Bodacious Dream in New Zealand, and so getting them reacquainted with the boat is job #1. During our practices, we’ll get to know the courses for the races, and try to get a feel for the local winds and currents – all of which will be crucial to our posting good results in the races to come. The boats are starting to arrive in La Rochelle, and we’re all looking forward to some top-notch racing and very competitive action. I’ll be back with more in just a couple of days. As I write this, Bodacious Dream is safely moored in La Rochelle, along the mid-western coast of France, halfway between Bordeaux and Nantes. I made the delivery here this past weekend to prepare for our upcoming race - The Mondial Class 40 World Championships - but more on that in a moment. One of the unique things about many of the harbors in France is the dramatic range of tides that make them virtually inaccessible during low tides. In order to make this work, locks are installed which keep the water in the basin where the boats are, while the tide changes. Here in La Rochelle, the tide can be in excess of 10 feet, and so with tides ebbing and flowing (high and low) twice a day, the locks are only open twice a day. For this trip from Lorient to La Rochelle, that meant I could only get into the harbor at 3am or 3pm – and only for a two-hour window. Coming into a strange harbor on your own in the dark of night is not considered good practice, so I opted for the 3pm option. Lorient to La Rochelle is about 140 miles. Class 40′s sail so easily that it’s not uncommon under pleasant conditions, to reach speeds of 9 or 10 knots. Friday’s weather offered a nice 15 knot breeze from behind for most of the day until evening, at which point the wind died down to nearly nothing. Upon completing my calculations, it became apparent that if I sailed the boat hard and motored when there was no wind, I’d get to La Rochelle just after the locks closed in the early morning, and would have to wait 12 hours for them to open again. With the forecast for a pleasant night and decent weather, I jumped at the chance to just sail in super relaxed mode.. a chance that doesn’t come along very often when you are in a race. I left Lorient at noon on Friday and sailed with the A5 spinnaker, as I wanted to see that it had been repaired properly after being damaged during the Quebéc-St. Malo race. The afternoon progressed quite nicely with the auto-pilot keeping us skipping along at 11 knots. Sunset came about 8pm, and with it the anticipated dying breeze. Typically, I’d work harder to keep the spinnaker flying and the speed up, but with so much time on my hands, I just rolled up the spinnaker and let the sails relax their way towards La Rochelle. Through that very quiet evening and night, I had time to reflect on what an amazing journey this past year has been. Gliding along at little more than 4 knots of speed, I took in the canopy of stars, and gazed out the transom at the glowing phosphorescent trail from the rudders. From where I was, I could see the lights of the French coast twinkle on and off as I sailed by. Napping on occasion, snacking on some cheese and crackers, allowed me some time to relive memories of the past 12 months. It was just about a year ago that I made my first trip to New Zealand to see work on the hull and deck of Bodacious Dream coming together. From there, sailing to Nelson on the South Island of NZ, to Auckland and onto the ship that brought Bo Dream to Ft. Lauderdale. Then up the coast to The Atlantic Cup Race in May and the great fun of winning the offshore leg. Then the delivery to Quebéc City for the Quebéc-St. Malo race, which took us up the beautiful St. Lawrence and across the Atlantic for this extended stay in France. 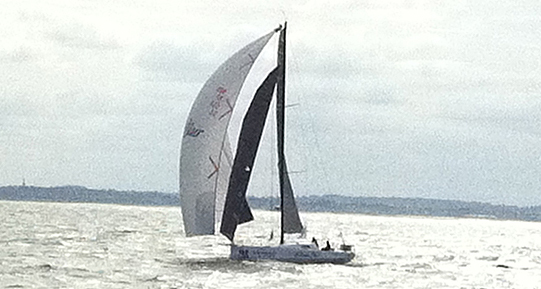 The Normandy Channel Race followed, and now down to La Rochelle to compete for the World Championship. Any one of those events would be reason enough to consider oneself a most lucky person. Toss in all the wonderful people I’ve met along the way, and “lucky” just doesn’t seem to cover it. “Incredibly fortunate” is perhaps more accurate. So, as I prep for the World Championships, my plan is to send out a few more updates – finishing the story of the Quebéc-St. Malo race as well as more on the Normandy Channel Race. Stay tuned for those now past due updates. And keep a look out for news on the Mondial World Championships that start October 3rd here in La Rochelle. The format here will be “course” racing. There will be a series of races each day and point totals will be added up at the end of the event on Saturday with the title of World Champion going to the lowest point total. First place gets 1 point, second 2, third 3….and so on. We’ll be up against some of the top talent in Europe in this event, so we (and my crew of 5 experienced New Zealanders!) look forward to some fun and exciting racing. The coverage won’t be like the tracking of the long distance races, but there will be updates on the Mondial website each day. (The site’s in French, so if you can figure it out, use your browser “translator.”) But we’ll also be providing updates on the BD website as well as on Facebook and Twitter, so that you can follow our progress that way as well. And thank you all for being part this amazing adventure. Remember, life is a grand adventure, live it all, live it always!! Well, it’s morning here in Caen, France anyway. Not sure just when you are reading this, since we are all spread around the world these days! 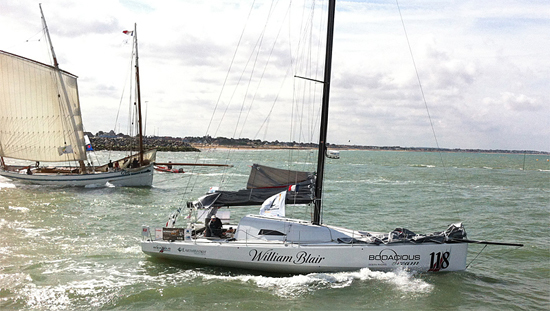 The Normandy Channel Race finished this weekend here in Caen. It was quite a thrilling finish as the first two boats came within just a mile or so of each other at the end. The two young guys on Concise finished just ahead of the Grand Masters on Campagne de France. Everyone was jubilant with excitement. It was fun to be here to see them finish and to hear the stories… and as you might imagine, it was difficult too not to be out there finishing along with the others. Sailing is an interesting sport. There is so much involved and disappointment is an everyday experience. Sometimes it comes from the wind or lack there of, sometimes from the currents or navigation and sometimes from some newly discovered Achilles heel in your program. But sooner or later, something disappointing is going to happen, and you must be willing to accept it and regain your balance. Being around Caen for the finish, hearing the stories from friends on other boats and seeing the joy in their faces was good medicine to help offset my disappointment in retiring early from the race. And as with most medicines, the first few tastes are awful, but as the healing begins, new horizons open. So, onto new horizons!! 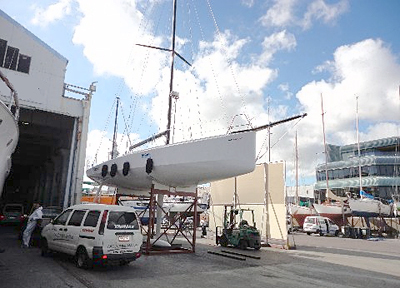 At the moment, Bodacious Dream sits at the boatyard in Lorient among the giants of the sailing world: Open 60′s, Class 40′s, 28′ Figaros, 21′ Minis and even Banque Populaire… the 120-foot Trimaran that recently set a record sailing around the world. As Matt and I thought about it, Banque Populaire sailed around the world at an average speed of 19 knots!! That’s the top range speed for Bodacious Dream!! This is a machine to see, and not just in a picture, but to see in person. It’s truly amazing. Matt got some good shots of Bodacious Dream in the shadows of Banque Populaire, so we’ll see if we can’t get one on the website for you! Soon, I’ll be driving back to Lorient with a car full of the gear we left here in Caen, so I can get settled back onto Bodacious Dream and look for a weather window in the next couple of days to sail to La Rochelle. That’s a trip of about 135 miles, and it will be our base for the upcoming Class 40 World Championships (in French only), in which Bodacious Dream is entered. This group of course races happens over four days, from October 3rd-6th. It’s totally different racing than what we’ve been doing lately – similar to the last portion of the Atlantic Cup. The competition is going to be very tough and exciting. We’re looking forward to an incredible week of sailing. One of the positive things that came about from retiring from the Normandy Channel Race was that we were able to sail Bodacious Dream south towards La Rochelle, which has opened up my schedule by about a week. So, instead of looking at a week to sail my way to La Rochelle, I only have another day’s worth of sailing. I’m hoping this will allow me time to see some more of France, and maybe even sneak in a trip to Ireland for some Irish music. So for now, I’ll pack up the car and head west. With Matt and I, there was barely enough room for the two of us, which is why we had to leave some of it in storage. 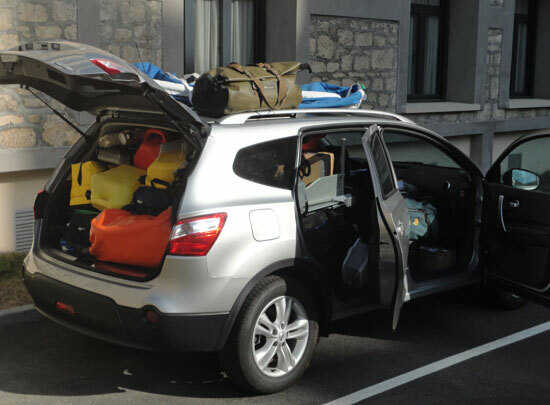 Today, I hope once I get the car fully packed, there will be room still left for me to drive!! Here’s a picture of the French Bodacious Dream mobile!! Typical of us Gypsy Sailors! And that all said, it’s time to live the dream!! As I write this, it’s about 08:00 on Wednesday morning, and we have just come to the point of Land’s End on the southwestern tip of England. As the sun rose up from the horizon, a beautiful and very fast tri-maran passed us as if we were standing still – and we were reaching at 13 knots of boat speed! It has been a very difficult morning, as we came to this point because it was the point I had picked to make a decision as to whether or not to continue in the Normandy Channel Race. As you can see by our position, our ability to stay competitive in upwind conditions was made more difficult by a repair we had to make to our sail. We had done the best we could with it, and after hoping that the weather might cooperate or that there might be an adjustment to the course that would make the prospects of finishing more viable, I made the decision to retire from the race. I have to say, this has been one of the toughest decisions I’ve made in quite some time. Adding to the decision, the weather and routing software we use suggests that the race, without considering adverse currents, would take us at least an additional six days to complete the course. There is also a high pressure ridge that will effectively eliminate any wind in the middle of the Celtic Sea, which is the water between Fastnet Rock and England. With the race rules as they are, and with only enough fuel to motor an additional 60 miles or so at the point of Land’s End, it made sense to sail while we have wind towards a French Port on the Northern Shore. Matt and I sailed very hard and tried our very best to be competitive. We hope the best for our fellow competitors and that the wind gods will look kindly down upon them. Hello everyone from the southern Coast of England!! We are about 15 miles South of Weymouth, England where earlier today we played some serious “Etch-O-Sketch” with the GPS Chart Plotter that keeps track of our navigation. We’ve learned some difficult lessons about ocean current here in the past few days. Yesterday, being just outside the grasp of wind put us behind and into an adverse current, and it took another tide cycle before we were able to enter the “Solent” and circumnavigate the Isle of Wright. Today, again with the Etch-O-Sketch, I was diligently trying to catch the competitor just in front of us, when we noticed a different look to the wind and water. Heading up, we were able to sail into wind, and the competitor just missed it. That started a couple hour battle where the objective was to sail as fast as we could to counter the adverse 4 knot current – though seldom negating it altogether. We started a large circle, which we could see inscribed on the Etch-O-Sketch. Quite amusing, but more interesting is that we never went backwards through the whole, large mile-sized circle!! As we sailed forward at 3 knots, the 4 knot current drove us backwards and around in a loop! We had a similar experience yesterday when with no wind, we were sent back and forth – east and west, across the entrance to the Solent waiting for wind, before realizing that it not being there at that moment was actually a good thing, as we couldn’t make forward progress, and so would likely have had to anchor and wait for the tide change anyway. So, it’s been an interesting trip so far, to say the least. Frustrating for sure, as the current has not been our only issue; we have a compromised jib as well. In the recent repair of the batten pockets, somehow the leach cord, an internal trim line, had been severed. The result is that we aren’t as beautifully efficient an upwind sailing machine as we usually are.. and most this race so far, has been light and upwind! But on the good side.. we are sailing on a beautiful day in the English Channel! It’s sunny with a crisp temperature, but a beautiful 9 knot wind and relatively flat waters. Even though we missed the current cycle last night, we had a beautiful sail through the Solent and around the Isle of Wright.. a famous spot from sailing history as the first America’s Cup race in 1851 was around the Isle of Wight. In any case, we finally got some wind late in the day and sailed the last ten miles with our new William Blair spinnaker, which looked and sailed beautifully. Once in the Solent, we were able to sync with the tides and sail around the island and out the Western entrance.. all under the beauty of the setting sun and rising moon. Quiet, peaceful, not real fast – but forward – so we were quite happy. Needless to say, these two events make up for the time we spent assessing the latest position reports….Ugh!! Right now, with the weather in front of us and our inability to sail as efficiently upwind, it looks like we may not finish the race until Tuesday or even later. There is a big high ridge that will block all of us for an extended period of time, not long after rounding Fastnet Rock. Such is the sport of Yacht Racing. Until later.. hope you all had a great Labor day!! In the U.S. that’s the holiday that marks the end of the summer. And for those of you elsewhere in the northern hemisphere, hope you’ve having a great end of Summer. And for our friends in New Zealand.. winter’s almost over and summer’s on its way!! The race started in 10 knots of wind, and we did a small triangle before setting out to the first island we had to round. It was upwind and going pretty well, 5th, until our boat speed took a small but noticeable drop while we were inshore of the competition, sailing lower and slower, we felt we had just sailed out of the wind line and were starting to be effected by the adverse current. We worked our way offshore across the back of most of the boats, fell to 13th, but still felt as though something was wrong. Finally, we decided to stick the boat into the wind and back down to see if something was on the keel and indeed there was a big glob of weeds – and so after some work, we were back up to speed. As it was getting dark, we sailed back to shore to find that we’d gotten back into about 9th. At that point, we sailed just a bit too far offshore and into an incredibly bad current at the same time the wind started to get light. It took us over an hour (and probably the loss of 5 miles to the competition) before we were out of the worst of it. At that point though, the wind had dropped to under 7 knots. As we continued to go upwind, we could clearly see that our ability to stay with the few boats around us was being compromised. A small lesson in sail selection: This boat’s intention, as most of you know, is to take Dave around the world next year in a mostly downwind fashion. On closed courses, such as this one, all points of sail are usually touched upon – reaching, downwind, upwind, etc. So far, since the start, we have gone upwind and in light conditions. In such conditions, a flatter sail is preferable – one that attaches to the tip of the bowsprit, which is very flat (think super sonic jet wing to minimize drag) so as to be able to sail close to the direction of the wind. We do not have one of these sails; ours is large and very full for more power (think C130 cargo plane, i.e., slow but powerful flight). Hence, our not so desirable position. The frustration also comes in knowing we’re on a really fast boat, like a Porsche, but without the correct sails for what we’ve been doing for the last 24 hours (or in the Porsche’s case, sitting on snow.) We know things will change, but will it be too late to get back in touch with the crowd? With this light wind, the only way to get through the Solent (the strait that separates the Isle of Wight from the mainland of England) is to have an outgoing tide. We know the leaders are there now. We are praying that we can get there in 10 hours to have the tide help us through it also, but are worried that they’ll be over the horizon and completely out of touch by then. In the face of it all, we are sailing and having fun with what we’ve got, but it’s difficult not to have all the same horses that the other boats have. As the trip continues, we’ll work on more ways to get Dave prepped for his big challenge. It’s early morning Sunday in Caen, and the last minute preps for the race are taking place.. final stocking of food and clothes onto the boat, return the car.. etc. Matt and I had quite a bit of fun, right in the middle of everything Friday, when the crowds began to pour into the race village area – which made walking down the sidewalk nearly impossible. At one point, Matt called out to me down below on the boat that someone wanted our autographs! Well, as it turns out, a lot of folks here have a competitor’s sheet for the race crews, and they just stroll around and collect autographs!! All afternoon, whenever we walked the sidewalk, people would stop us and ask for our autographs!! What an interesting turn for a couple of Great Lakes sailors for whom the only autograph we’re usually asked to sign, is a charge receipt! Anyway, hope you’ll have time to enjoy some tracking of the race. The weather looks to be fairly mild, without too much wind. It’s likely to be a seven or eight day race, but still full of all sorts of interesting navigation problems posed by the many cargo, ferry and fishing boats we’ll pass (as many as 200 per day,) as well as the unpredicatable currents and pockets of wind – and no wind. You’ll likely see lead changes happen often, which should make it all more exciting. There are some contingencies in place to shorten the race, so we’ll have to see what develops. Matt and I are certainly hoping to at least round Fastnet Rock, one of the legendary pinnacles of sailing. So for now, we’re packed up and heading to the boat. We’ll have more details to share in a week or so, when we return here to Caen. We will also be doing our best to get whatever updates Matt and I can manage to send, up and on the Bodacious Dream website as well as on our BD Facebook page.